I was a little apprehensive about what this month's box would contain after the disappointing Christmas one. Luckily though, it seems as though Amarya have listened to customer feedback and pulled it back a little this month! This is a good box with some varied products. 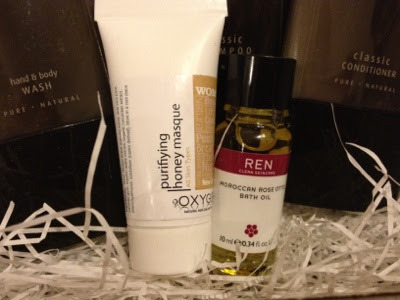 The REN rose bath oil is amazing, so I was very happy to receive this little bottle (maybe enough for 2 or 3 baths). I've not heard of Gielly Green before, but the lovely Sandra of Beauty Balm (who is my natural product guru) tells me that they are great. They smell very fresh, so I will give them all a try and see how I get on. I'm also looking forward to trying out the honey mask as the winter is making my skin a bit funny - dry one day and oily the next, so hopefully this will balance it out! All in all a good box and I'm glad I kept my subscription for this one. I think this box looks quite good! I would love to try the Ren oil. This seems like a very good box! I'm only subscribed to Glossybox so cannot comment on the quality of this brand, but this box seems generous! This looks great. The Gielly Green products look lovely. Looks awesome! They all look so nice.